Can SpaceShipTwo fly up to space? During its 25 years of peering out at the farthest depths of the Universe, the Hubble Space Telescope has enabled humanity to witness countless amazing sites from here on Earth. Here we present the Hubble Top 100 list. It has been compiled, and is regularly reviewed, by staff of ESA/Hubble. A couple of quick notes before we get you to all the amazing images though. For this commemorative issue, we asked a number of scientists to share their thoughts about the Hubble Space Telescope. Their responses are printed throughout this Top 100 list. Please note that their quotes are not always about the same image shown. Also, we’ve tried to present as many of the images at full size as possible, however, extremely large images have been downsized to 5000 pixels on largest axis. “A lot of iconic Hubble images have shaped my career, from the Pillars of Creation [Original 1995 image is #82 on the Top 100 list] to the Hubble Ultra Deep field [#7]. It is no wonder that public is excited. Hubble offers far sharper and deepest views of our Universe. We are witnessing the birth of stars and galaxies like ours, to observations of dark matter and even dark energy. 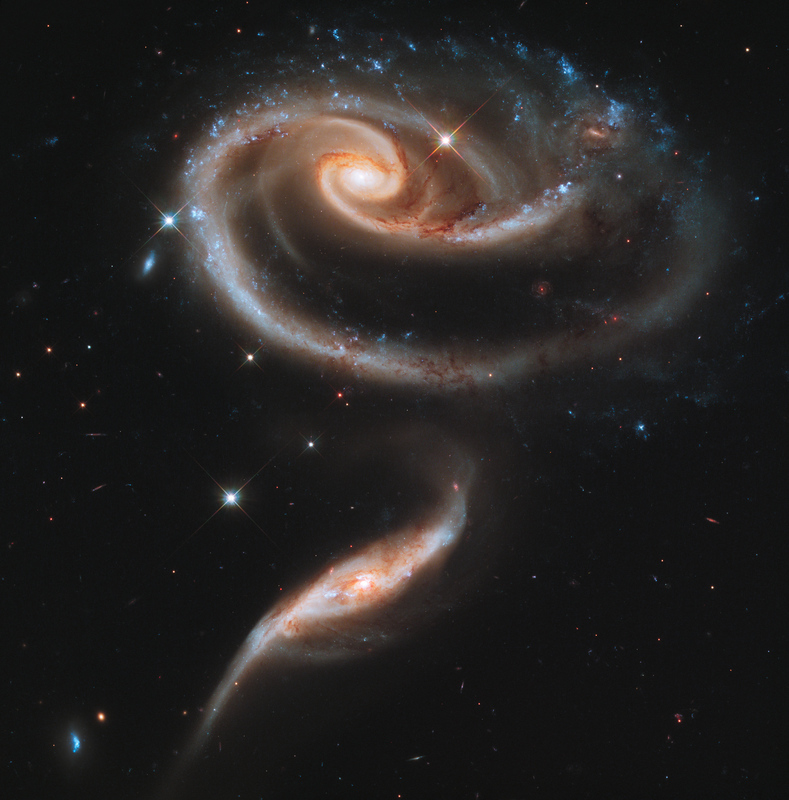 This image of a pair of interacting galaxies called Arp 273 was released to celebrate the 21st anniversary of the launch of the Hubble Space Telescope. “A study by the University of Michigan found that a significant proportion of people shown a picture of a galaxy, taken with the Hubble Space Telescope, reported, ‘images like this show how small and fragile planet Earth is in the context of the Universe.’ People respond to Hubble’s remarkable astronomical images: Hubble images trigger their intrinsic sense of wonder and satisfy their innate curiosity. As the New York Times wrote in 2002, ‘The Hubble Space Telescope… has taught us to see properties of a universe humans have been able, for most of their history, to probe only with their thoughts.’ Hubble has been a source of awe-inspiring images for a quarter of a century. Each year, Hubble’s education programs reach over 500,000 pre-service and in-service teachers in the U.S., and over six million school children use Hubble material in their curricula. Science teachers across the nation can point to an image taken by the Hubble Space Telescope and say, ‘only the United States can do this.’ A 2013 survey of nearly 10,000 undergraduate engineering majors found that almost 1 in 5 identified ‘work at NASA’ as their dream job (Forbes, 6/12/2013), and Hubble is a big part of that. 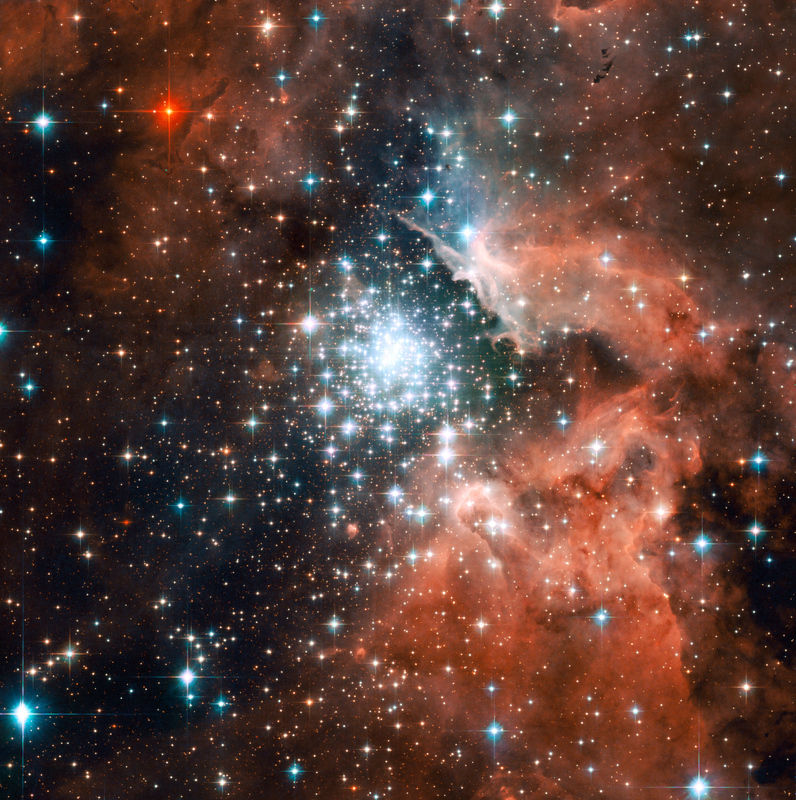 The star-forming region NGC 3603 – seen here in this Hubble image – contains one of the most impressive massive young star clusters in the Milky Way. 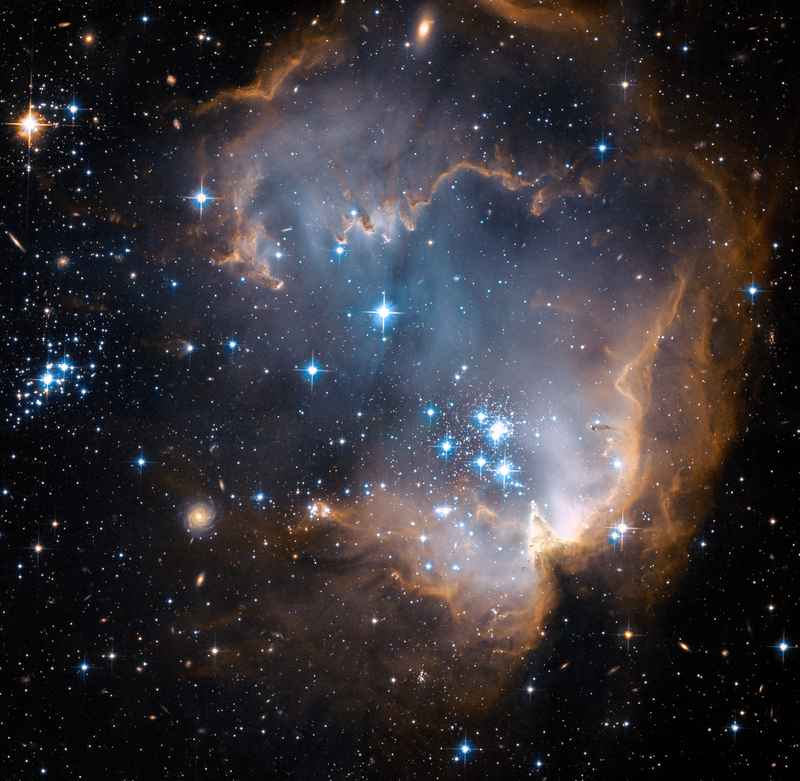 Bathed in gas and dust the cluster formed in a huge rush of star formation thought to have occurred around a million years ago. The hot blue stars at the core are responsible for carving out a huge cavity in the gas seen to the right of the star cluster in NGC 3603’s centre. 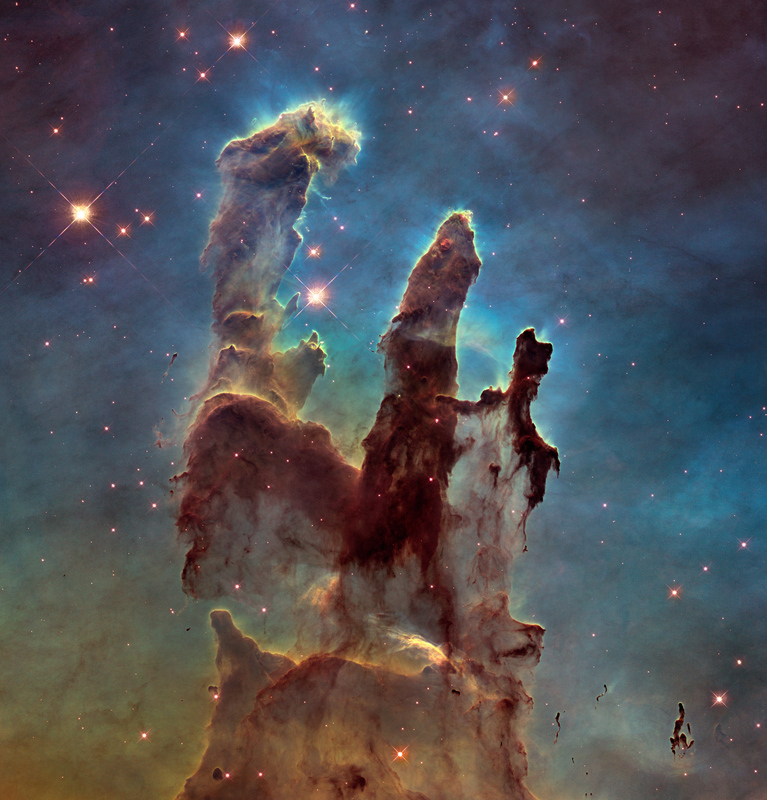 “There’s an art to making beautiful images from scientific data, and the Hubble team has mastered it. Hubble also came of age at the same time as the internet, which created a great opportunity to distribute large format, high resolution images that are absolutely stunning on computer desktops and screen savers. Before that most people only saw astronomy images published in books or newspapers. “Hubble also had a fairly dramatic beginning, with the discovery of the flawed mirror and the subsequent mission where astronauts actually traveled to the telescope in order to repair it. Hubble has snapped the best ever image of the Antennae Galaxies. Hubble has released images of these stunning galaxies twice before, once using observations from its Wide Field and Planetary Camera 2 (WFPC2) in 1997, and again in 2006 from the Advanced Camera for Surveys (ACS). Each of Hubble’s images of the Antennae Galaxies has been better than the last, due to upgrades made during the famous servicing missions, the last of which took place in 2009. The galaxies — also known as NGC 4038 and NGC 4039 — are locked in a deadly embrace. Once normal, sedate spiral galaxies like the Milky Way, the pair have spent the past few hundred million years sparring with one another. This clash is so violent that stars have been ripped from their host galaxies to form a streaming arc between the two. In wide-field images of the pair the reason for their name becomes clear — far-flung stars and streamers of gas stretch out into space, creating long tidal tails reminiscent of antennae. 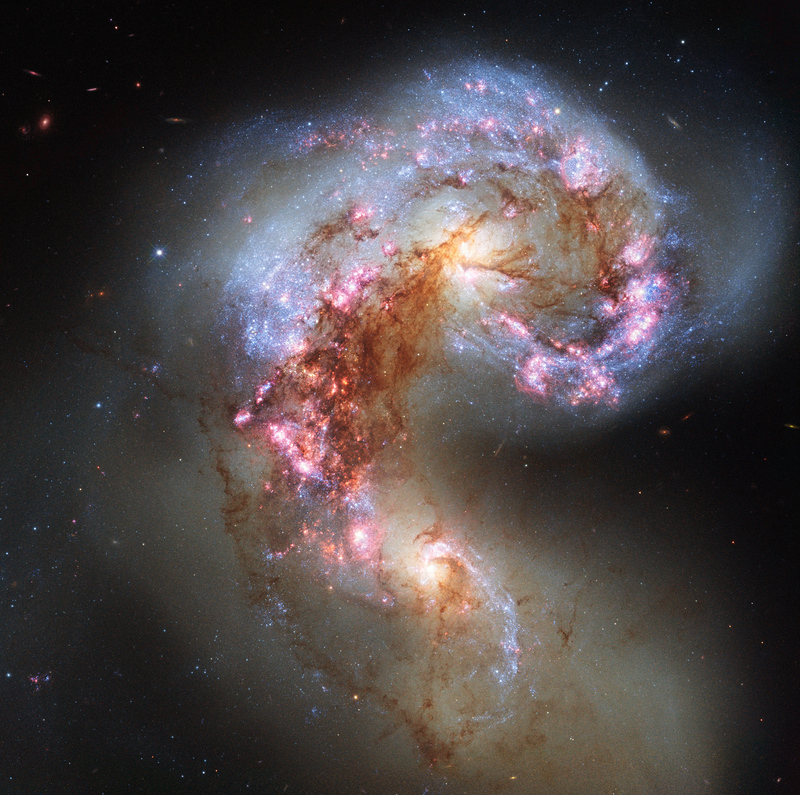 This new image of the Antennae Galaxies shows obvious signs of chaos. Clouds of gas are seen in bright pink and red, surrounding the bright flashes of blue star-forming regions — some of which are partially obscured by dark patches of dust. The rate of star formation is so high that the Antennae Galaxies are said to be in a state of starburst, a period in which all of the gas within the galaxies is being used to form stars. This cannot last forever and neither can the separate galaxies; eventually the nuclei will coalesce, and the galaxies will begin their retirement together as one large elliptical galaxy. 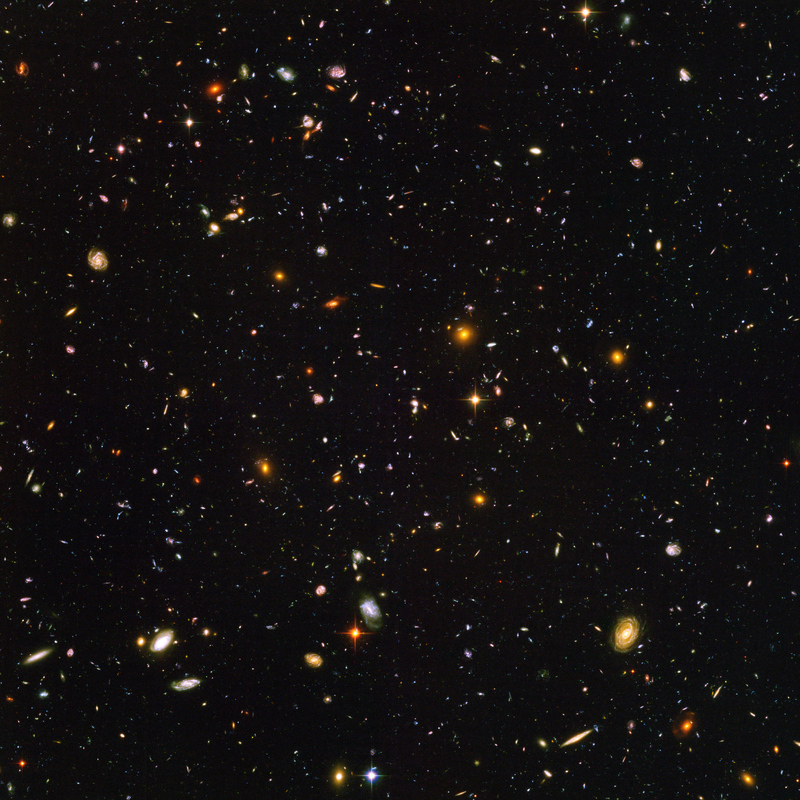 This image uses visible and near-infrared observations from Hubble’s Wide Field Camera 3 (WFC3), along with some of the previously-released observations from Hubble’s ACS. This Hubble image, captured and released to celebrate the telescope’s 23rd year in orbit, shows part of the sky in the constellation of Orion (The Hunter). 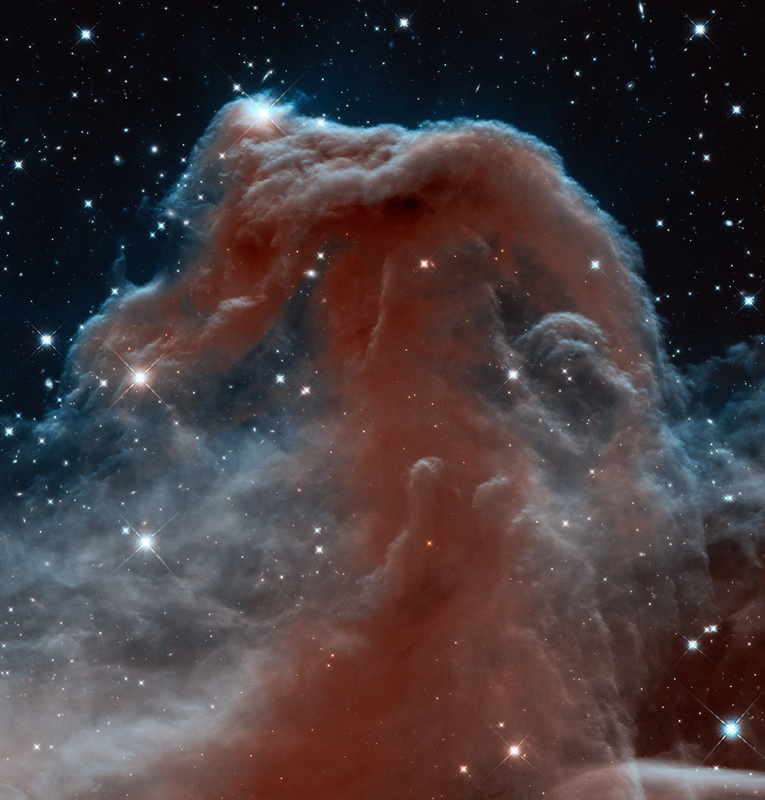 Rising like a giant seahorse from turbulent waves of dust and gas is the Horsehead Nebula, otherwise known as Barnard 33. This image shows the region in infrared light, which has longer wavelengths than visible light and can pierce through the dusty material that usually obscures the nebula’s inner regions. The result is a rather ethereal and fragile-looking structure, made of delicate folds of gas — very different to the nebula’s appearance in visible light. “I am one of the professional astronomers from the generation that grew while the amazing pictures of Hubble were released. As a young girl I heard a talk in a planetarium about supernova, red giants, white dwarfs, black holes which I found extremely fascinating. This was just around the time that the Hubble was repaired and its first astonishing images were released to the public. “In 1995 the Pillars of Creation [#82] was printed full page in one of the main Dutch newspapers that we read at home. I cut the picture from the newspaper and it must have been on my bedroom wall for many years after, until the paper started turning yellow. The image shows three immense beautiful dust pillars, surrounded by hot bright stars that are irradiating them. Deep inside these pillars new young stars and their planets are born. 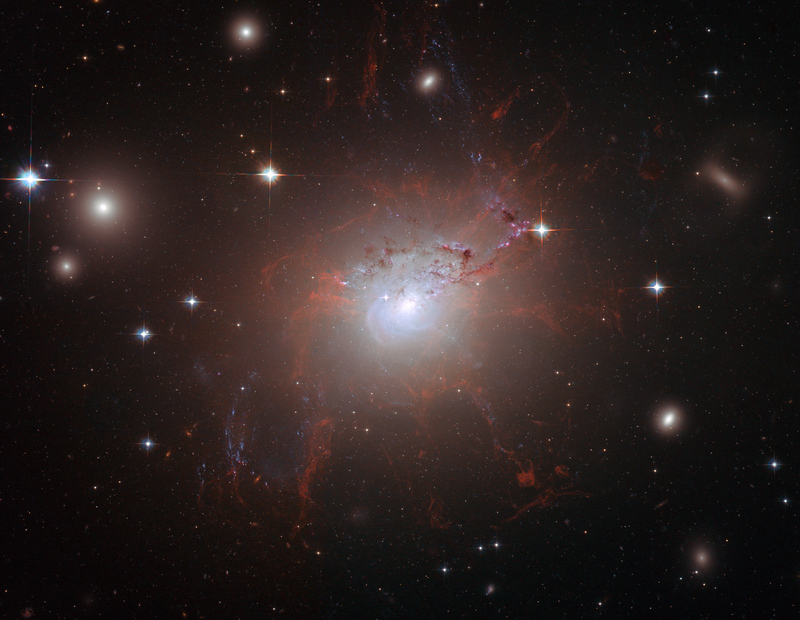 This stunning image of NGC 1275 was taken using Hubble’s Advanced Camera for Surveys in July and August 2006. It provides amazing detail and resolution of the fragile filamentary structures, which show up as a reddish lacy structure surrounding the central bright galaxy NGC 1275. These filaments are cool despite being surrounded by gas that is around 55 million degrees Celsius hot. They are suspended in a magnetic field which maintains their structure and demonstrates how energy from the central black hole is transferred to the surrounding gas. By observing the filamentary structure, astronomers were, for the first time, able to estimate the magnetic field’s strength. Using this information they demonstrated how the extragalactic magnetic fields have maintained the structure of the filaments against collapse caused by either gravitational forces or the violence of the surrounding cluster during their 100-million-year lifetime. The filaments seen here can be a gaping 200 000 light-years long. The entire image is approximately 260 000 light-years across. Galaxies, galaxies everywhere – as far as the Hubble Space Telescope can see. This view of nearly 10,000 galaxies is the deepest visible-light image of the cosmos. Called the Hubble Ultra Deep Field, this galaxy-studded view represents a “deep” core sample of the universe, cutting across billions of light-years. The snapshot includes galaxies of various ages, sizes, shapes, and colours. The smallest, reddest galaxies, about 100, may be among the most distant known, existing when the universe was just 800 million years old. The nearest galaxies – the larger, brighter, well-defined spirals and ellipticals – thrived about 1 billion years ago, when the cosmos was 13 billion years old. In vibrant contrast to the rich harvest of classic spiral and elliptical galaxies, there is a zoo of oddball galaxies littering the field. Some look like toothpicks; others like links on a bracelet. A few appear to be interacting. These oddball galaxies chronicle a period when the universe was younger and more chaotic. “1) The Pillars of Creation [#82] is an iconic photograph taken by Hubble showing a glimpse of gas and dust regions veiling new star formation. This image was taken in 1995, long before my career in astronomy took off, while I was still only in middle school. There is something mysterious and beautiful about the process by which new stars are born. 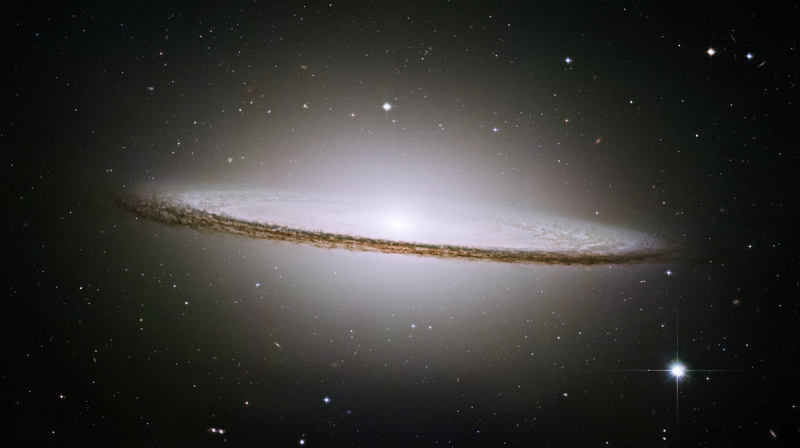 Hubble has trained its razor-sharp eye on one of the universe’s most stately and photogenic galaxies, the Sombrero galaxy, Messier 104 (M104). The galaxy’s hallmark is a brilliant white, bulbous core encircled by the thick dust lanes comprising the spiral structure of the galaxy. As seen from Earth, the galaxy is tilted nearly edge-on. We view it from just six degrees north of its equatorial plane. This brilliant galaxy was named the Sombrero because of its resemblance to the broad rim and high-topped Mexican hat. At a relatively bright magnitude of +8, M104 is just beyond the limit of naked-eye visibility and is easily seen through small telescopes. The Sombrero lies at the southern edge of the rich Virgo cluster of galaxies and is one of the most massive objects in that group, equivalent to 800 billion suns. The galaxy is 50,000 light-years across and is located 28 million light-years from Earth. This Hubble image depicts bright blue newly formed stars that are blowing a cavity in the centre of a fascinating star-forming region known as N90. The high energy radiation blazing out from the hot young stars in N90 is eroding the outer portions of the nebula from the inside, as the diffuse outer reaches of the nebula prevent the energetic outflows from streaming away from the cluster directly. Because N90 is located far from the central body of the Small Magellanic Cloud, numerous background galaxies in this picture can be seen, delivering a grand backdrop for the stellar newcomers. The dust in the region gives these distant galaxies a reddish-brown tint. “I have fond memories of the Comet Shoemaker-Levy 9 impacts with Jupiter in 1994 [#52]. Many scientists, including myself, spent all week at the Space Telescope Science Institute analyzing the data and generating color images and maps of the impact scars in Jupiter’s clouds. Because the telescope mirror had recently been corrected, the beautiful details visible in every image were amazing. “Since then, I find that every new image is just as exciting and awe-inspiring. Perhaps one of my favorite images of Jupiter is from 2014 [#97]. We were using Hubble to study changes in the Great Red Spot, and when we began to process the images, we realized Ganymede’s shadow was directly in the way! This Hubble image – among the largest ever produced with the Earth-orbiting observatory – gives the most detailed view of the entire Crab Nebula ever. The Crab is among the most interesting and well studied objects in astronomy. This image is the largest image ever taken with Hubble’s WFPC2 camera. 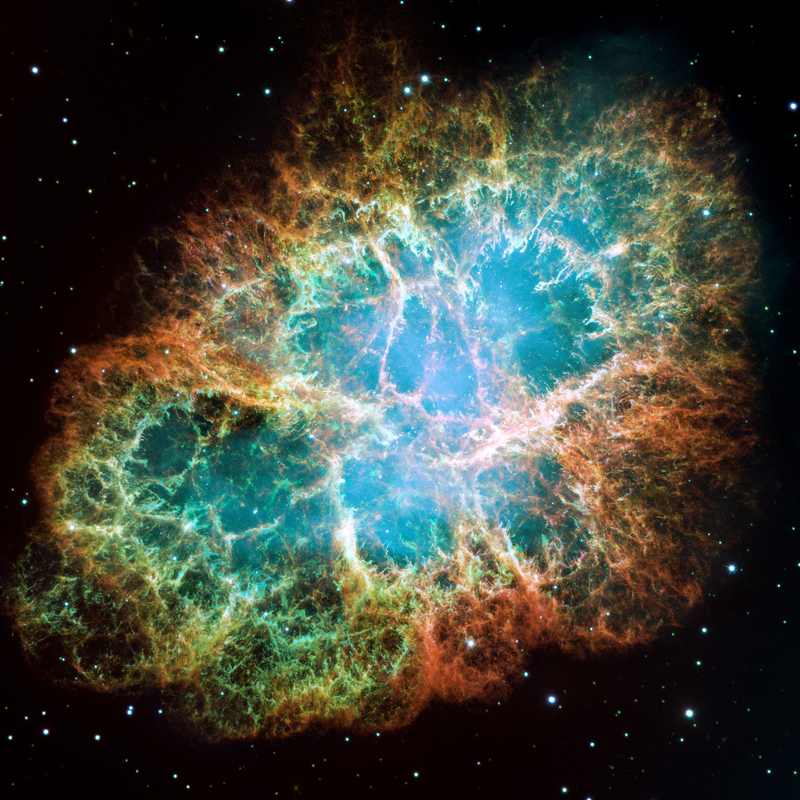 It was assembled from 24 individual exposures taken with the telescope and is the highest resolution image of the entire Crab Nebula ever made.